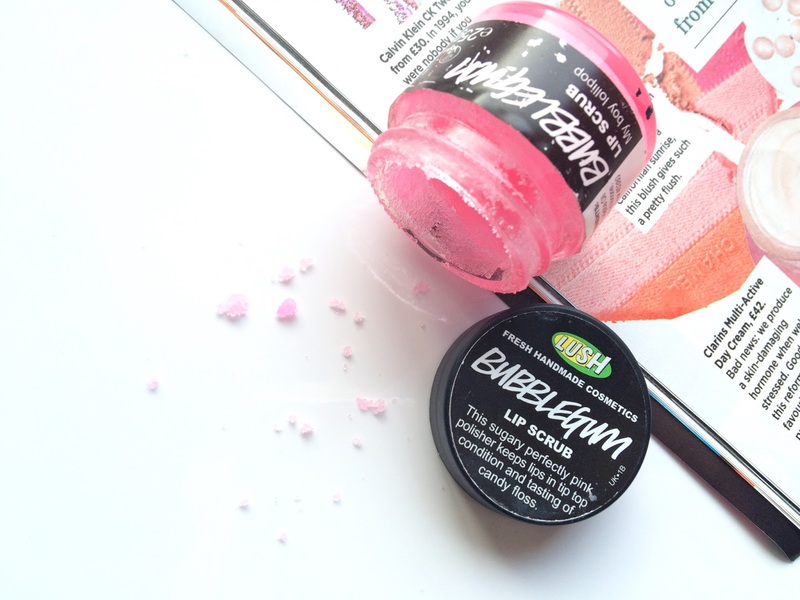 Up first is a product which I quite honestly can't live without, no exaggeration (well obviously a little exaggeration) - LUSH's Bubblegum Lip Scrub. I first discovered this products waaayyyy back in 2011 when a friend of mine brought hers into a Maths lesson. We then spent the next 45 minutes scooping the sugary pink substance out of the pot and eating it, that's just how delicious it it. I'm so glad that she brought it in that day, as five years later I have two pots behind me and a third still going strong. I must use this product at least once a week, especially recently with my current chapped lip problems. The product works as a scrub (duh) and by applying it to clean, dry lips it removes any dead skin and leaves your lips soft, supple and flake-free. I have a cheeky habit of applying it just to lick it off again, it tastes just like candyfloss oddly enough, despite being bubblegum flavour. It can be purchased here for £5.50, which I will admit is a little steep considering it's mainly sugar and essential oils. I will however recommend using it with caution though, as over-enthusiastic scrubbing can leave your lips feeling a little sore. I like to use a creamy lip butter directly after using my lip scrub, which brings me to the next product on my list. 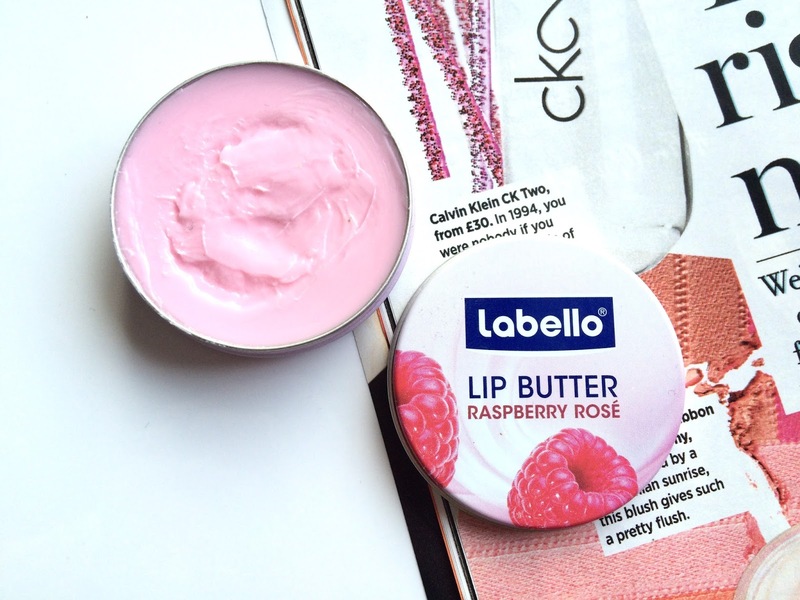 I actually received this lip butter as part of a gift from a friend in Germany and after doing a little bit of research I have found that the brand Labello is actually the German equivalent of Nivea. The taste is almost indescribable, that's how good it is. The only thing I can liken it to is Swizzels Drumstick lollies, the milk and raspberry flavoured ones! The lip butter creamy and a little gloopy, it requires some rubbing in. It does have a little colour to it, which I like a lot. I mainly apply this butter either after using the lip scrub, or immediately after b rushing my teeth before I go to bed in order to let it soak in overnight. I always wake up with gorgeously soft lips in the morning, ready for lipstick to be applied. I don't tend to use this product throughout the day due to it's gloopiness. It does require a mirror to apply or otherwise it leaves a white tinge when it's first applied to lips. Apart from that one downside it truly is a fabulous product and can be purchased from Superdrug for £2.09 here. My final product is one that most of you will have heard of and possibly already own, and that is the Baby Lips moisturising lip balm in "Quenched", the original flavour. For the purpose of this article, I actually wanted to feature the Mango Pie flavour, however when it came to taking the photos I couldn't find it! Drat! Quenched is also a wonderful lip balm, and while others say it has no flavour I myself think it tastes like Hartley's orange jelly! It is incredibly addictive and I carry mine almost everywhere I go (which is why there's not much left.) I will say that although they promise 8 hours of moisture on the Baby Lips website, you pretty much get half an hour tops after applying the product, which is why I go through it so quickly. It feels almost watery on the lips and is very light to wear, which is probably why I like it so much. I nearly always apply it before I put on lipstick as I don't like the feeling of lipstick when it dries. I own so many Baby Lips lip balms - Quenched, Peppermint, Cherry Me, Pink Punch and Mango Pie and whilst they are expensive in the UK at around £3-£4 each, I actually got my Mango Pie flavour from Poundland! So keep your eyes peeled! What are your go-to lip care products? I can't live without Aquaphor! I apply a really thick layer before I go to bed and wake up to super soft and moisturized lips. It doesn't really taste like anything though, which is probably for the best so I don't end up eating all of it lol! Bleugh I hate vaseline on my lips. I love putting burts bees on my lips before bed, I find it's the only thing that actually helps. Some lip products just sit on top and temporarily moisturise. I'm really keen on trying the Lush Lip Scrub though, I bet it smells amazing! Thanks, thank goodness I'm not alone! Awesome post! 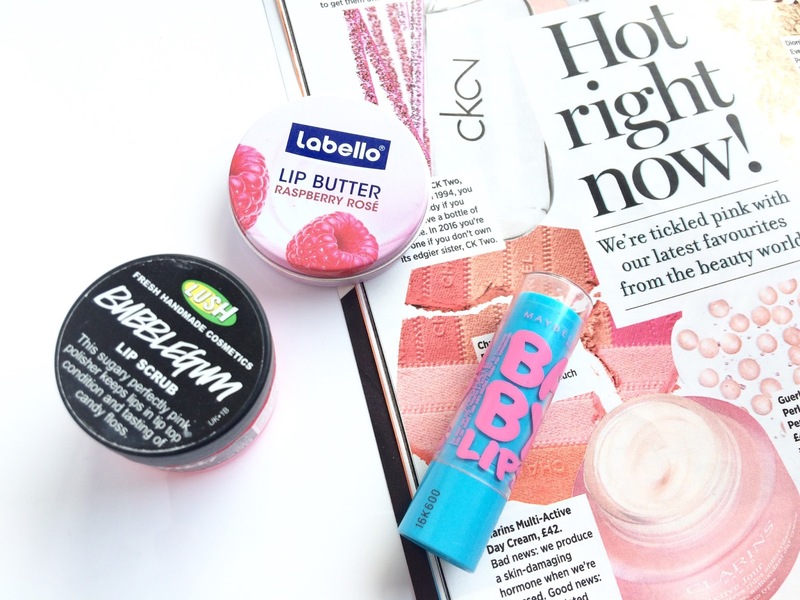 Labello lip products are my favourites! Thank you my dear, I'm so glad you enjoyed it! I love my EOS lip balm! 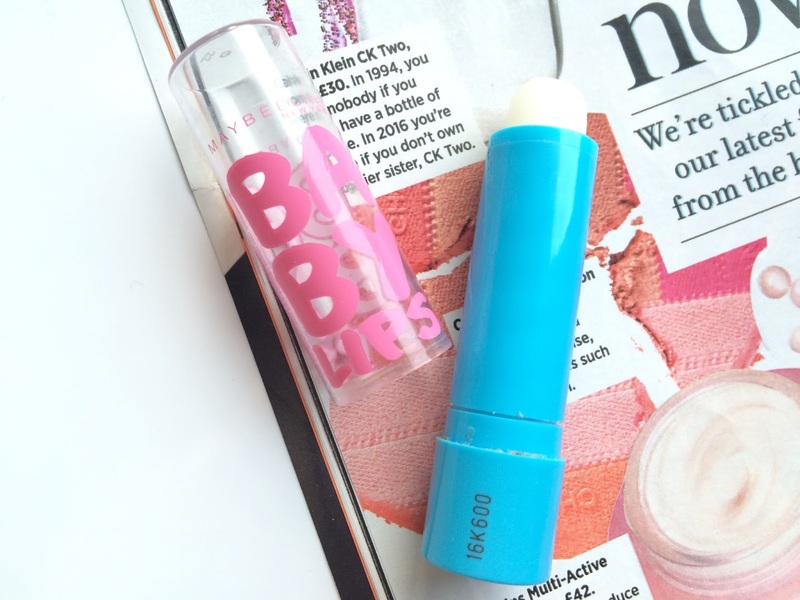 I've never tried a lip scrub before and I could really do with one at the moment! Next time I'm in Lush I'll be purchasing some! I've honestly never had an EOS lip balm, I've never even them in shops round here! What flavour would you recommend if I were to order one online? Deffo get a LUSH scrub - my friend says the popcorn one is also amazing! Ok, unpopular opinion... I hate all of the Baby Lips products, I don't know what it is but they always smell really latex-y to me. I do agree with you on the raspberry nivea one though, it's gorgeous. I also love my mint EOS ball and Body Shop's lip butters. I have a lemon one that's been discontinued (sob) and a pink grapefruit one that I <3. I love this post Alice!! I now want to try that lip scrub, I'm not a huge bubblegum flavour fan but it sounds like no matter what, it will taste/smell delicious! Next time I'm in LUSH I'll need to grab it! Oddly enough it tastes like candyfloss, not bubblegum at all! I'm so glad you liked the post!